Since 1972, National School Nurse Day has been set aside to recognize school nurses. National School Nurse Day was established to foster a better understanding of the role of school nurses in the educational setting. National School Nurse Day is celebrated on the Wednesday within National Nurse Week. This year, School Nurse Day is May 8, 2019. 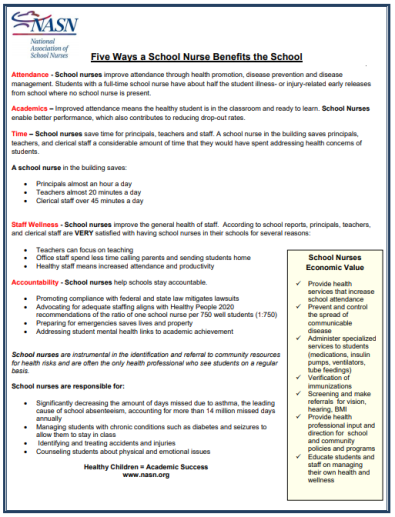 NASN has put together a toolkit you can use in your schools and communities to help spread the word about School Nurse Day. The theme for this year is School Nurses: Making the Grade on School Health. The toolkit includes social media posts, images, and information to help celebrate the contributions from school nurses. You can download this icon to commemorate School Nurse Day on your social media platforms or school website. You can spread the word in your school by printing this poster for your school nurses. School nurses optimize student health and learning every day of the year. But, on National School Nurse Day, we take special time to celebrate and recognize the contributions that school nurses are making to the health and learning of our nation’s 50 million children. NASN wishes you a happy School Nurse Day! Write a letter to the editor with our template. How and why school nurses are needed and how school nurses are a positive return on investment: Maughan, E. D. (2016). Building strong children, Why every student needs a school nurse! American Educator. Spring.